Education Secretary Betsy DeVos had to be escorted away from a public school when protesters physically obstructed the entrance. The controversial reformer eventually made it inside, and also heard from members of the teachers’ union. 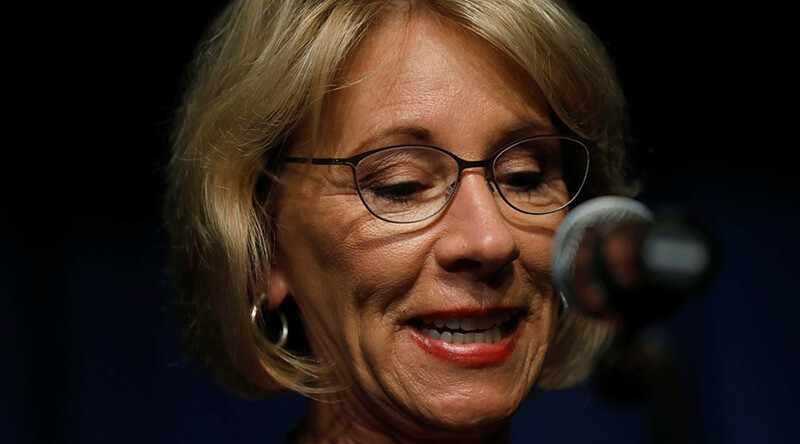 Devos’ first official visit to a public school since narrowly being confirmed as the new secretary of the US Department of Education indicated that she might be the most divisive figure in President Donald Trump’s Cabinet. “She does not represent anything that they stand for!” one protester yelled while using her arms and body to block a stairway to Jefferson Middle School Academy in the District of Columbia on Friday morning. Another demonstrator badgered Devos as she walked away with her security detail. The Washington Teachers Union, while not taking part in blocking DeVos’ visit, did show their opposition to her agenda. One teacher held a sign saying, “Ms. DeVos: Our children are not props,”according to the Washington Post. Others took the time to express to the secretary their disagreements, while wishing her success in giving all students an equal opportunity to free public education. WJLA's Tim Barber reported that DC Police arrested a male protester for assault on an officer, and that police were investigating allegations that DeVos was also assaulted. Inside the school, DeVos toured classrooms and met with the school’s teachers and principal as well as the district’s chancellor.